I'm testing SVN. After the configuration, I can add/commit the files successfully. However, I can't see the status icons on the files and folders. Can anybody tell me why? I have never been able to solve this permanently, this is only a work-around. Keeping TortoiseSVN on the latest version may or may not help. Note that the clean up will only clean up your local working copy, it wont do anything to the actual repository. Its a safe operation. Apparently this is not enough according to your comment. Do you have lots of other programs that are also using overlay icons? If so maybe you can find a solution in this thread: TortoiseSVN icons not showing up under Windows 7? The second most voted answer also deals with network drives etc. Its a good read. You rebooted your PC of course after the installation? If you haven't please do so now. TortoiseSVN is a windows Explorer Shell extension and will be loaded together with Explorer. Otherwise, try doing a repair install (and reboot of course). To fix this go to TortoiseSVN > settings > Icon Overlays > Status cache changed from default to shell. If the drive A or B is used check the Drive type as A and B. The following article explains this more fully and shows how to fix it. However as dropbox gets updated relativity frequently on my machine, and I rarely update Tortoise SVN I would suggest just appending spaces to the tortoise entries to push them up the list, otherwise you'll have to do all this again when a dropbox software update is installed. Run “regedit” and locate: "HKEY_LOCAL_MACHINE\SOFTWARE\Microsoft\Windows\CurrentVersion\ Explorer\ShellIconOverlayIdentifiers\"
terminate explorer.exe from task manager and re-run explorer.exe task. I met this problem with TortoiseGit and TortoiseSVN. DropBox renamed its registry entry with more white spaces as prefix " " than I did for Tortoise. Tortoise directly can open the registry editor by TortoiseGit > Settings > Icon Overlays > Overlay Handlers there click Start registry editor and rename entries so that the first in alphabetical order to be what you want. My overlays disappeared all of a sudden (or so I thought). 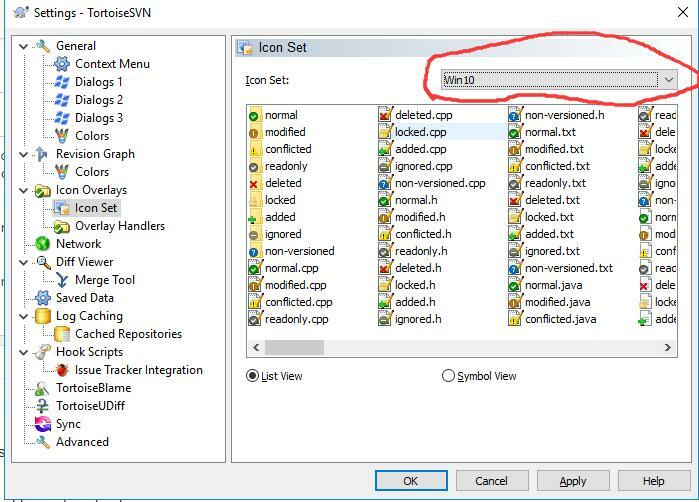 I came across this article https://corengen.wordpress.com/2014/07/30/my-tortoisesvn-icon-overlays-have-disappeared/ which points out that windows has 15 slots for overlay icons; 4 are reserved for windows, which leaves 11 for other applications. Regardless of how many overlay keys are in the registry, Windows selects the first 11 in alphabetical order. When I upgraded Office, OneDrive added overlay icons -- prefixed with a lot of spaces -- pushing down Tortoise's overlays below the threshold: windows registry Since I am not using OneDrive, the solution was to add a "z" to the OneDrive key names. This is not a problem, like Avada Kedavra said, actually, this is documented here, in the section "Icon Overlay Settings", and I also show bellow. You can read that, and choose the one you like most. Caches all status information in a separate process (TSVNCache.exe). That process watches all drives for changes and fetches the status again if files inside a working copy get modified. The process runs with the least possible priority so other programs don't get hogged because of it. That also means that the status information is not real time but it can take a few seconds for the overlays to change. Advantage: the overlays show the status recursively, i.e. if a file deep inside a working copy is modified, all folders up to the working copy root will also show the modified overlay. And since the process can send notifications to the shell, the overlays on the left tree view usually change too. Disadvantage: the process runs constantly, even if you're not working on your projects. It also uses around 10-50 MB of RAM depending on number and size of your working copies. 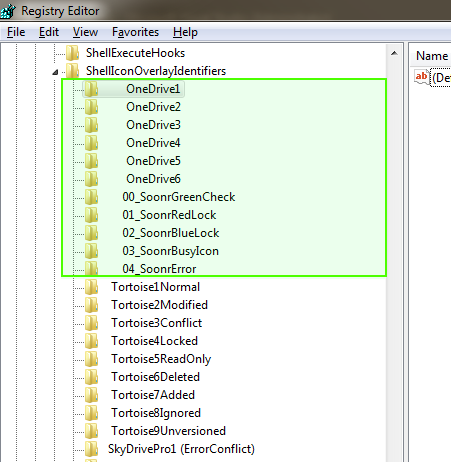 Caching is done directly inside the shell extension dll, but only for the currently visible folder. Each time you navigate to another folder, the status information is fetched again. Advantage: needs only very little memory (around 1 MB of RAM) and can show the status in real time. Disadvantage: Since only one folder is cached, the overlays don't show the status recursively. For big working copies, it can take more time to show a folder in explorer than with the default cache. Also the mime-type column is not available. With this setting, the TortoiseSVN does not fetch the status at all in Explorer. Because of that, files don't get an overlay and folders only get a 'normal' overlay if they're versioned. No other overlays are shown, and no extra columns are available either. Advantage: uses absolutely no additional memory and does not slow down the Explorer at all while browsing. Disadvantage: Status information of files and folders is not shown in Explorer. To see if your working copies are modified, you have to use the “Check for modifications” dialog. First clear the temporary files in Windows system, then restart your system. I encountered same problem when I upgraded from Windows 7 to 10. Eventually I have to re-install SVN and reboot the system and it worked. However, I have to manually upgrade each SVN directory to new SVN 1.8 format (it showed up automatically on explorer on right click to upgrade the directory to latest version). Hope this helps. I found a simple solution, just open Settings of TortoiseSVN, and expand Icon Overlays, select Icon Set and change the icon set. The default icon set of mine is XP Style, and I change it to Win10 because Win10 is the OS I am currently using. Restart your computer and problem gets solved. Tortoise SVN on Windows happens to lose sync quite often with the real file status. In that case try doing an svn cleanup. Another thing, it may also depend where your source files are located, different drive, network drive, etc. There's an option in Tortoise to allow icon overlay or not, on remote drives.